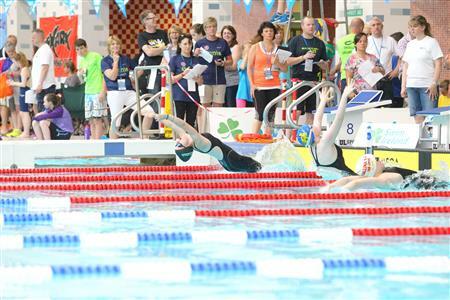 Six swimmers from Castlebar made the trip to the city of Limerick at the end of the June for the annual Irish Age Groups Division 2 swimming championships. For swimmers, this is their Wimbledon, their All-Ireland final, their Champions League final. For the past ten months, they have been training hard, striving to attain their qualifying times; and getting to swim at this level is a huge achievement for any young swimmer. Megan Deely with the bronze medal she won for the 800m freestyle. Over the four-day competition, with 78 swimming clubs and 512 athletles from all over Ireland in attendance, the Castlebar swimmers acquitted themselves remarkably well. It's not unusual for nerves to strike at this level of competition, and rare is the person who doesn't feel nervous when faced with a challenge like this, but the ability of these athletes - aged between 12 and 15 - to pick themselves up, dry themselves off and face into the next challenge with equanimity is quite impressive. First up, on Thursday evening was the 800m freestyle, and Megan Deely capped off a great year in swimming to take the bronze medal, taking 11 seconds off her previous best time. She finished on 10:37.84. In the 400m IM, a tough swim at any level, Niamh Breslin and Rachel Henehan swam very well, finishing on 6:09.11 and 6:25.63 respectively. : Rachel Henehan (far left) gets off to a flying start in her backstroke event. Next up was the 100m backstroke, which saw Sarah Conlon finishing on 1:23.38, a personal best time for her. Rachel Henehan also achieved a PB in her age group in the same stroke, finishing on 1:20.90. Niamh Breslin also swam in this event. In the 200m freestyle, Megan Deely gained a PB to finish on 2:30.10, while Niamh Breslin finished on 2:33.41. For the boys, Aaron Doherty took nearly three seconds off with his time of 2:20.38, and finished in the top ten, just narrowly missing a place in the final. Niamh Breslin, Sarah Conlon and Megan Deely with coach Joe Moran poolside at the UL Arena. The breast stroke was up next, and Megan Deely gained another PB, finishing on 1:32.55, an improvement of one-and-a-half seconds on her previous best time. There was a PB in this event also for James English, who touched home in 1:25.98, placing him in the top twelve. In the 400m freestyle, Aaron Doherty came fifth overall with a time of 4:55.24. The 200m backstroke brought plenty of PBs for Castlebar swimmers, including Sarah Conlon (3:04.62), Niamh Breslin (2:46.23) and Rachel Henehan (2:52.90). 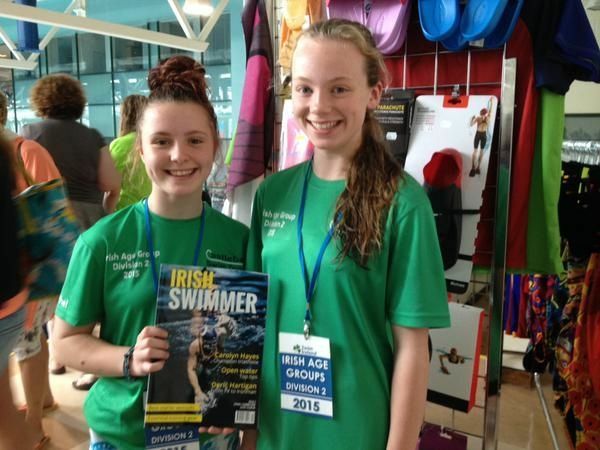 Rachel Henehan and Sarah Conlon pictured at the Division 2 championships in Limerick. In the 200m individual medley (IM) - which sees swimmers completing 50 metres of each of the four strokes - Niamh Breslin had a good, strong swim and achieved a PB of 2:51.90. James English also performed well in this event, and took four seconds off his previous time to finish on 2:44.17. There was another PB for Megan Deely in the 400m freestyle, and she finished very strongly on 5:10.36. Niamh Breslin also swam well in this event and finished on 5:15.27. In the 200m breaststroke, James English achieved a four-second PB to finish on 3:06.99; while Sarah Conlon also PB'd in this event to finish on 3:31.46. There was a good swim also from Megan Deely, who finished on 3:13.06. The last Castlebar swim of the competition came from Niamh Breslin, who finished out the event on a high note, achieving a PB in the 100m freestyle (1:07.95). Megan Deely in action in the breaststroke. And so, with the electronic timing system finally powered off, dozens of Swim Ireland officials in their trademark white got to draw breath after a hectic four days, while families began the weary task of packing up the picnic coolers and the ink-marked and water-splashed programmes and setting off for home. No doubt the young Castlebar swimmers, like all those who took part, will be looking forward to a well-deserved break over the next few weeks of the summer. Division 2 swimmers and their coach (l to r): Rachel Henehan, Megan Deely, Joe Moran, James English and Sarah Conlon. Absent from the photograph are Niamh Breslin and Aaron Doherty.